Luxord seemed to be gambling wits with this particular Bouncywild, it was bouncing off everything, until he finally caught it using stop. He then swiped it with a spinning card and finished it off. The Powerwilds seemed to be putting up quite a fight with her and she began to get frustrated. She destroyed one of them and took a deep breath. She couldn't allow herself to get angry, not like she had when she fought with Sora. It was something that she didn't want to happen again, because it would harm her greatly and others near her, and the last thing she wanted to do was hurt Luxord. Sayuri felt her hand, where she held her keyblade, shake and she looked at the heartless, trying to ignore the shaking. She let out a short huff and she hit the Powerwild, destroying it quickly. Time to end this one, we've wasted enough in this fightLuxord thought as he brought up a card wall to block the attacks on Sayuri. He then used the wall to cut up the rest of the Powerwilds. Usually Sayuri would protest to having someone else finish off the heartless since it waa nessesary for her to destroy them. This time though, she sighed and was actually grateful that he had finished them off. Her head was still hurting a lot and the pain seemed to be getting stronger, though she tried to act as if nothing was wrong with her. Her arm lowered a bit and before she wanted it to, her keyblade disappeared. Sayuri looked at her empty hand slightly and shrugged. She was probably just more tired than she thought. Sayuri lifted a hand to her head and she slowly shook her head at Luxord. "No, it's okay. I'm fine." she sighed. Of course she wasn't fine because she had a bad headache that meant a memory was going to come to her. Sometimes she wished that she already knew about her past so this wouldn't happen to her so much. Luxord watched her walk past him with a neutral expression, he didn't believe it one bit. But he decided to let it go for now. He checked inside one of the tents and found only cooking materials. Sayuri got the feeling that Luxord didn't believe that she was okay, like she said. But she couldn't tell him the truth about what was happening to her, only Akiharo knew about her memories coming back. She walked over to where a fire seemed to have been mafe, and she kneeled next to it. It appeared that whoever this place belonged to, they made it to stay for quite some time. Especially since he could smell leftover food smell inside the kitchen tent. He stepped out of the tent and watched Sayuri for a second before checking another tent. With a gloved hand, Sayuri picked up a burnt stick that had not been completely burned yet. Whoever had been there hadn't been gone long. It seemed like they had just put new firewoood in there before whatever it was that happened to them. This had to be the job of a heartless, it just had to be. "Heartless ...?" she half stated, half asked Luxord. Luxord shook his head "I didn't think Heartless got a taste for tea and fine cuisine. No...this is something different." He scratched his chin in thought. Sayuri looked up and walked toward Luxord. "An animal that lives around here?" she asked. If a heartless didn't do it, then it was more likely that an animal that inhabited this jungle to have done something. She sighed and ran a hand through her hair. Sayuri looked at the ground, and sighed. "Well, there are still apes. Maybe one of them did that. Either that or some human around here." she said softly. Luxord checked in a tent. Inside he found a wierd contratpion. He tapped small lever, then toggled it to reveal photos. Sayuri followed Luxord into the tent shortly after he entered it. She tilted her head as she watched the photos be revealed. The girl stepped closer to them and examined them as if they reminded her of something. Sayuri stared at the photos, her eyes stopping on one in particular. There was a girl in the background that looked really familiar to her. The question was why this girl looked so familiar, her hair was long and a lighter shade of blue than her own hair. Sayuri grabbed a strand of her hair and looked at it. "No. I don't recognize anything." she told Luxord, moving away from the photos a bit. Sayuri looked at the other photo where Luxord had indicated. "Hm ..." she said in thought. The looked a bit familiar to her, but she had no idea why. Sayuri stared off in the direction where the gun shots had sounded for a moment. Something about all this seemed so familiar, it was as if she had been here before. But this was her first time here, but that didn't mean Akira hadn't been here before. As the heartless appeared, her gaze returned to the site where she and Luxord were. She glanced at the heartless and then at Luxord. He looked at the heartless then leapt toward Sayuri. He landed next to his companion "We don't have time to deal with these annoyances, we lose the conduit, we lose our chance to harvest more hearts." he told her before snapping his fingers. 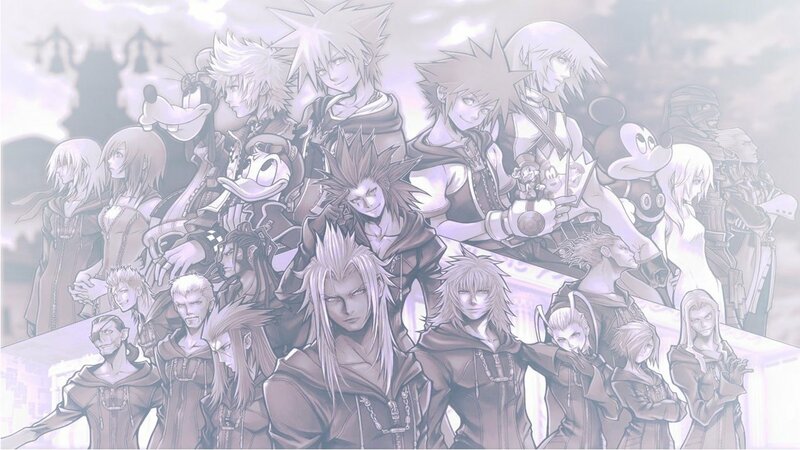 Several Dusks appeared between them and the Heartless. With a sweeping gesture of his hand, the Nobodies engaged his enemies. "These will buy us the time we need. Let us be off while the off is naught" some ryhme that was Luxord thought but gestured for Sayuri to accompany him. The girl stared at the Tusks that appeared between them and the heartless. Biting her lip she looked back at Luxord. "Are you sure its okay to leave them here with these heartless?" she asked him a bit concerned. She wasn't sure why but she got a bad feeling about not destroying these things herself. Hesitating for a moment, Satiric followed Luxord to wherever the sound had come from. "They are but husks, as crual as that may seem. They'll end up going back to the dark sooner or later." Luxord pushed through some branches "And besides, their sacrifice won't be in vainif we find this hunter"